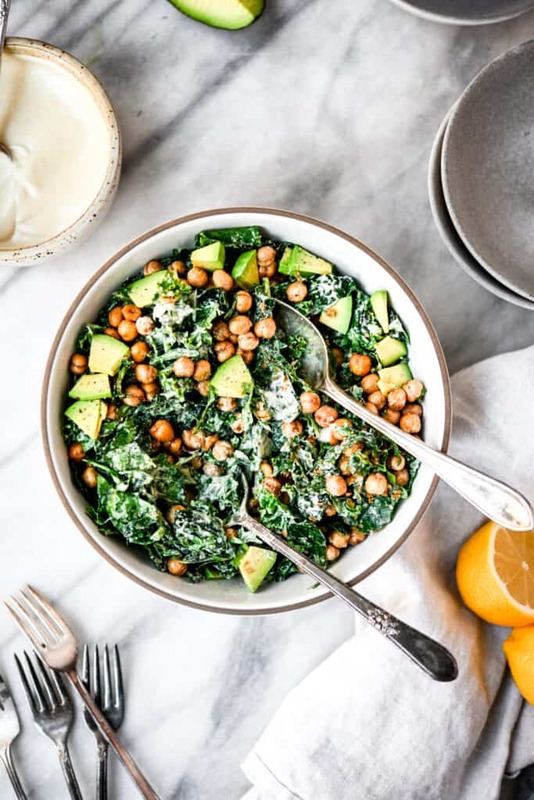 This Vegan Kale Tahini Caesar Salad with avocado and crunchy chickpeas will convince even the pickiest eaters to eat more greens. It’s the perfect lunch, side dish, or even dinner if you load it up with extra chickpeas and avocado! We’ve been making a variation of this salad after having a similar dish at a New York restaurant 2 years ago. Every time we make it, people ask for the recipe! It’s also super simple to make, which is a plus for a salad (which can be a lot of work). There are a few special ingredients that give this addictive vegan Caesar dressing its flavor. First, though tahini isn’t a traditional Caesar dressing ingredient, it’s the star here. However, I admit I’m (slightly) addicted to tahini, so I may be biased. It lends a nutty flavor and creaminess that’s hard to achieve with just cashews. My older brother is allergic to tree nuts though, so we also often omit cashews. To do so, simply replace the cashews with more tahini and halve the amount of water. Other star ingredients include nutritional yeast for a cheesy flavor, lemon, Dijon mustard and a touch of caper juice (the liquid from a jar of capers). Caper juice adds a salty, briny flavor you’d typically get from anchovies. Side note: the rest of our family adds grated parmesan, which is an option if you’re not dairy free/vegan. Crunchy chickpeas replace traditional croutons in this Caesar. Of course, you can use croutons if you’d prefer. 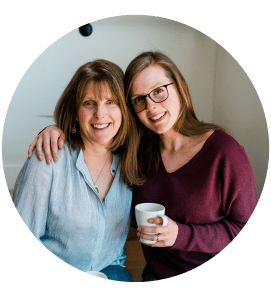 We always have store-bought or homemade roasted chickpeas on hand. We add them to salads for texture. Finally, avocado is a no-brainer – extra healthy fat and creaminess that you can’t beat! In the end, this Vegan Kale Tahini Caesar Salad is an easy, go-to healthy recipe. No matter how many times I make it, I find myself craving it day in and day out! Want to try homemade crispy chickpeas? These za’atar roasted chickpeas are our favorite! 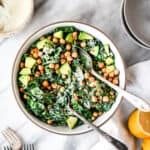 This Vegan Kale Tahini Caesar Salad with avocado and crunchy chickpeas will convince even the pickiest eaters to eat more greens. The perfect lunch, side dish, or even a full dinner if you load it up with extra chickpeas and avocado! Soak cashews in warm water for 1-2 hours. Drain and rinse. Add all ingredients to blender and blend until smooth and creamy. Taste and adjust as needed. Wash kale and pat dry. Remove stems and tear into small pieces (or use knife). Add to large mixing bowl and toss with dressing. Top with chickpeas and diced avocado. If you have a nut allergy, you can sub cashews with more tahini and reduce amount of water by half.